Since I recently attended Vans Warped Tour a few days ago, I thought making a post about things that you can carry and bring with you would be important for anyone who doesn’t know what to bring. Here is a list of things that I packed with me for Warped Tour. After Warped Tour, including the variety of things I brought with me, I bought a few extra things and received free things as well. Here is the list of other things I received that day. Shirt from Hope For The Day’s tent that they collaborated with Real Friends. Flag from Movements tent that the band signed during their signing. Here is a picture of some of the things I had with me at the end of Warped Tour. I had a great time at this year’s Vans Warped Tour. When the lineup was announced in March, I was hoping for a few more bands I knew that were performing. From March until Warped Tour in July, I learned a lot about bands and had a great time. For more information about what happened during Warped Tour, check out my previous blog post and my Instagram @ovictoriamedia. There were a variety of albums that came out today including: Always Lose by The Gospel Youth, Dead Reflection by Silverstein, Punk Goes Pop Vol. 7, For The Night To Control by Electric Century, The Fear by Night Argent, Stealing The Covers Teenage Bottle Rocket, the deluxe edition of The Hunna’s alvum 100, and Howling, For The Nightmare Shall Consume by Integrity. There are new songs out by Stages & Stereos (“We’re Fvcked, Boys”) , Sleeping With Sirens (“Legends”) and Neck Deep (“Motion Sickness”). New albums are expected by Circa Survive and Sleeping With Sirens in the coming months (more albums to be released can be found in a blog post I wrote). COIN announced a part two to their previous tour for How Will You Know If You Never Try across the United States. In addition, Rise Records signed MAKEOUT to their record label. I want to welcome back The Dangerous Summer back into the music scene. The band teased two videos on their social media sayin “Hello” and “Tomorrow” and revealed the group is back together and is working on a new album which will be releasing in 2018. *Follow along with my future concert experiences by following me @ovictoriamedia on Instagram and Twitter. This entry was posted in In Case You Missed It..., Music Related Event, Updates and tagged !! !, Always Lose, Animals Are Not Ours, Band Merchandise, Concert, Dead Reflection, essentials, Hope For The Day, Memorable Day, Merchandise, movements, neck deep, New Albums, New York, North well Health At Jones Beach Amphitheater, punk goes pop vol. 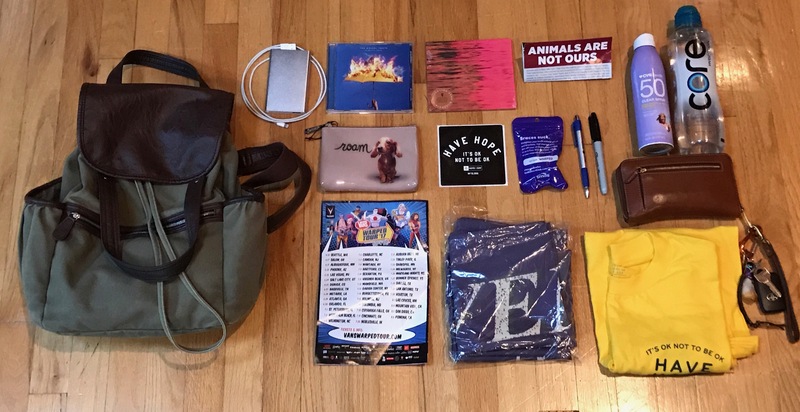 7, Silverstein, Stay Hydrated, The Gospel Youth, The Hunna, Too Close To Touch, Vans Warped Tour, Vans Warped Tour 2017, Wantagh New York, Warped Tour essentials, What to pack for Warped Tour. Bookmark the permalink.